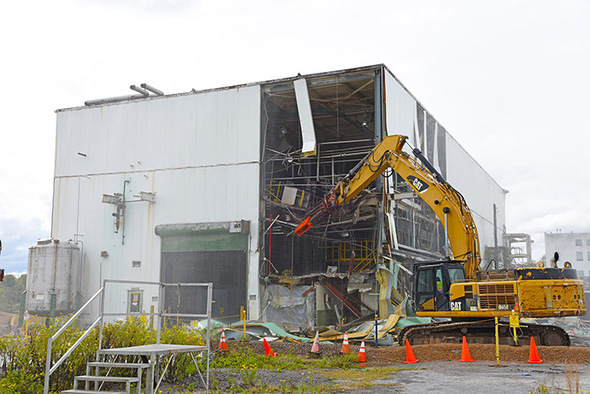 Crews began tearing down the K-1232 Chemical Recovery Facility in October 2018. DOE’s Oak Ridge Office of Environmental Management (OREM) and cleanup contractor UCOR have safely completed the demolition of the K-1232 Chemical Recovery Facility at the East Tennessee Technology Park (ETTP). Crews began the teardown in early October by bringing down a 74-foot-tall silo that was part of the facility. The silo, made of stainless steel, was shipped for recycling. Demolition of the main structure then commenced and was completed Nov. 20. Workers are now removing the structure’s slab. The 8,400-square-foot, two-story facility was built in the early 1970s to recover chemicals resulting from site activities. The building’s original recovery operations were shut down in 1982, and the facility was then used to treat wastewater from the Y-12 National Security Complex during the 1980s and early 1990s. The building was located in the Poplar Creek area of ETTP, which once housed several facilities that supported the site’s gaseous diffusion uranium enrichment operations. One by one, the Poplar Creek area facilities have been coming down as OREM moves closer to its goal of cleaning up ETTP and converting it into a private-sector industrial park, national park, and conservation area. Removal of K-1232, along with several other structures in the Poplar Creek area and across the site, opens more land for economic development. Other major recently demolished Poplar Creek facilities include the K-832-H Cooling Tower, K-832 Cooling Water Pumphouse, K-1203 Sanitary Sewage Treatment Facility, Building K-633 Test Loop Facility, K-1314 Complex, and several tie lines that connected the buildings. OREM and UCOR are working to complete major cleanup at ETTP in 2020. That vision is being realized, as OREM has already demolished more than 400 buildings and transferred almost 1,300 acres from government ownership.